One of my unofficial resolutions for a while now has been to create my own content for Shot of Brandi*. Featuring other bloggers/websites content has always been a bit scary for me. While I always site my source and the photos, I always have a fear that someone will reach out and be upset that I featured their content. To be honest, that’s why I didn’t blog as much last year. This weekend I went to the craft store…alone. Usually I stick a craft trip in while Brady is waiting in the car in between running errands, but this time I went alone. It was glorious. For under $45 I bought several craft projects that I can’t wait to feature on here. And $6 of that $45 was spent on a mini-crafting iron. It’s the most adorable thing! First up was my last project of the day – a wine tote. Now one of my supplies wasn't in that $45 and I must say that I was very skeptical of this, but it turned out to be my favorite item of the day. A few weeks ago at Michael’s, I purchased this Glitter Iron on Paper for $8. It was originally $16, but I had a 50% off coupon. The wine tote was $1 from Pat Catans (local Pittsburgh craft store). 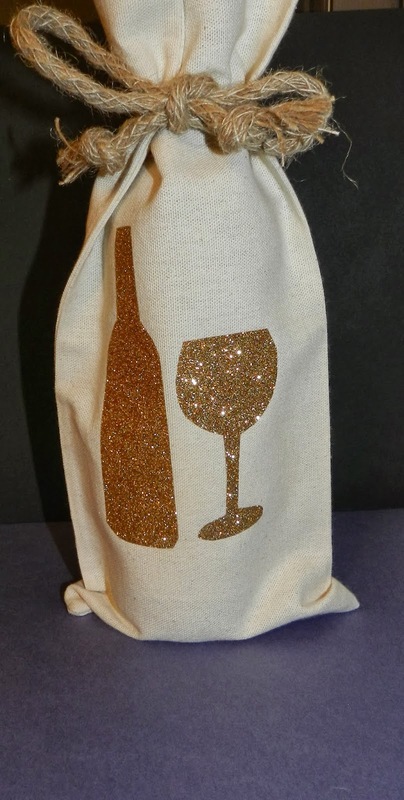 For the pattern, I just Googled “Wine Bottle and Glass” and voila! Now, here’s the tricky part. With iron on paper, you typically need to print things backwards. That’s why I tried the bottle/glass combo first – it doesn’t matter if it’s backwards. BUT with this stuff, you iron over it. So you don’t need to print backwards. Basically, you iron your item for 20-25 seconds. Then, you put the non-glitter side of the paper down on your item. You leave the clear film on the top of the glitter. Then, you put down a cloth or towel over your cut outs and then press down on the iron for 20-25 seconds. Then, you flip your item over and iron down for another 20-25 seconds. I ended up using my real iron once I discovered it wouldn't touch the glitter because it got hotter than the mini one. Once your item is dry, you peel off the clear film and BAM! You’re a craft genius! So in the end, I made this for like $2 because I still have a full role of paper. Disclaimer: This iron on paper is apparently for some fancy machine that cuts out shapes. But I just printed some stencils and cut out my own stuff. I feel a little guilty, but I would totally skip the machine. I have another larger tote and wine bag, so I’ll be sure to share what I make with those goodies! This is fabulous!!! I'm pinning and I'm doing it asap! I have so many crafts I want to do soon but this is too cute to wait on - thanks for sharing! It's SUPER easy, Chelsea! The directions were a little tricky for me, but basically the flat side goes down on your item, you keep the vinyl cover on and you iron down. It's not like other iron on papers where you need to print backwards either. Good luck and let me know if you have any questions!